More women hold senior management positions in senior living than in other U.S. industries, but that does not hold true all the way to the top executive roles. Specifically, about 70% of senior management positions in senior living are held by women, compared to an average rate of about 56% of these positions being held by women in the United States as a whole. But of the 115 largest senior living provider companies, only 17.5% are helmed by a female CEO — which is about even with the national rate of 16% of executive positions being held by women. Those figures come from “The Path Forward,” a new white paper from Argentum. 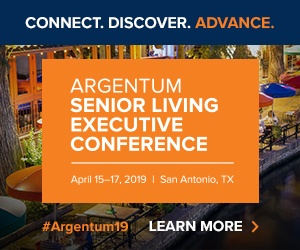 The senior living association launched a Women in Leadership initiative last fall, and laid out further plans and goals in the white paper and at its annual conference in San Antonio on Monday. The Women in Leadership initiative is meant to increase the proportion of women in top leadership positions at a crucial time, as about 40% of multi-site senior living CEOs are set to reach retirement age in the next five years. Statistics also show that bringing more gender diversity into C-suites and boardrooms improves business performance. For example, going from no women in corporate leadership to 30% correlates to a one percentage point increase in net margin, according to research cited by the white paper. And a 2017 Deloitte study found that companies with inclusive hiring, promotion, development, leadership and team management generate about 30% more revenue per employee than competitors without such policies. When women sit on corporate boards, these companies tend to see benefits such as more effective risk management, fewer financial reporting mistakes and fewer shareholder battles, the white paper noted. Brentwood, Tennessee-based Brookdale Senior Living (NYSE: BKD), the largest provider in the nation, has shifted the composition of its board to be half women and half men. The company is already seeing changes, said Executive Vice President of Community and Field Operations Mary Sue Patchett. Given the relatively high proportion of women in senior management roles — not to mention that its workforce overall is 80% female — senior living has a head start on many other industries when it comes to improving gender diversity at the highest levels. Measuring key indicators of gender diversity, including the development of a gender equity index. Celebrating success stories through an industry-wide communication strategy. Supporting women through tools and resources such as mentorship programs. Educating the public at large about career opportunities in senior living. The initiative is being led by a committee of two-dozen women who have already achieved leadership positions, with Integral Senior Living President and CEO and COO Collette Gray serving as chair. On Monday, Gray moderated a panel of women who shared their stories of rising through the senior living ranks, and imparted some ideas and advice for those who aspire to follow in their footsteps. Saying that she has experienced “a bit of a utopia of a career,” Eclipse Senior Living COO Shamim Wu noted that the industry as a whole does an admirable job of supporting women through life milestones such as having children. She herself was offered a promotion while pregnant. Still, women must make an effort to be true to themselves and find the right fit in terms of an organization, she emphasized. “Trust your gut,” she said. Training your replacement is a great way to set the stage for your own advancement, Brookdale’s Patchett advised. Gray supported this idea as well. “Developing bench strength is important,” she said. Patchett also endorsed working with a career coach and being willing to make a lateral move, or even take what might seem like a step back, to gain the skills and experience necessary for further advancement. Sarabeth Hanson, president and CEO of Harbor Retirement Associates (pictured above), said that one of her most difficult — but best — career decisions was to leave a larger company for a smaller one, where she could learn new skills and take on a C-suite position more quickly. Developing new skills means going outside one’s comfort zone, which is crucial to career advancement, she emphasized.